Smart has released a new commercial, highlighting that the new smart fortwo is the perfect car for the city and anything but cliché. 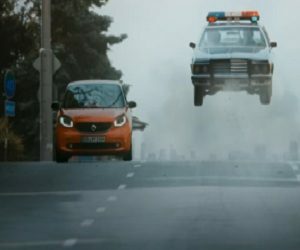 The 40-second spot, titled “Epic car chase”, invites you to see what happens when the city’s most unconventional car, Smart Fortwo, meets one of cinema’s most conventional clichés, a police car in the middle of an epic car chase (according to the police officers on it), featured in slow-motion. “That’s a big cliché”, says the driver of the Smart, heading off to get a donut. The commercial ends with the tagline “Anything but cliché” and with the invitation to have a Smart fortwo for a test-drive now.